Everyone who’s taken a Bateau Mouche ride on the Seine has seen the copy of the Statue of Liberty installed on the Isle des Cygnes, near the Grenelle Bridge. While it is a miniature of the real statue, it’s no tiny thing. It’s 40 feet tall. 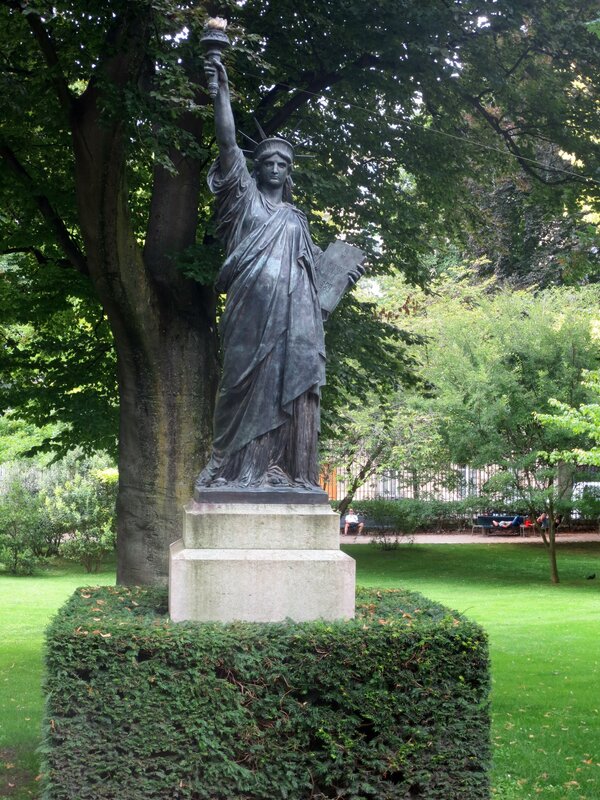 For landlubbers, there are (at least) two other good copies of Lady Liberty to be seen in Paris. The sculptor, Auguste Bartholdi, donated a smaller copy to the Luxembourg Museum in 1900. Five years later, it was moved outside to the Jardin du Luxembourg, the famed Luxembourg Gardens. It stood there for more than a century, until 2012, when it was moved to the Musée d’Orsay. A newly constructed bronze replica (photo above) stands in the garden. There is much more detail on the Musée d’Orsay web page, and on Wikipedia. A life-size copy of Liberty’s torch stands above the entrance to the Alma Tunnel near the Seine. That was the tunnel in which Princess Diana died, so it has become an informal memorial to her.